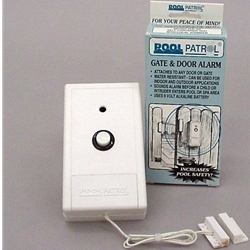 The Pool Patrol Door/Gate Alarm w/Remote Capabilities GA-25 attaches to any door or gate for indoors or outdoors use. It sounds an alarm before a child or an intruder enters pool or spa area. Do you have two doors, a gate and a door or some combination of doors and/or gates? Used along with GA-30 or the remote receiver (sold separately) you have the added comfort of alarm sounding in house as well as at sight. Custom outdoor additional passthrough buttons and remote receivers are also available for special order (contact us for details). Note that special orders may take 5 to 10 business days to ship.